Some genres lend themselves to prequels more logically than others, and horror seems like one with strong possibilities. After all, it makes sense to get some idea of how homicidal maniacs came to that end, right? 2017’s Leatherface lets us see background for 1974’s Texas Chain Saw Massacre. In 1955, young Jed Sawyer (Boris Kabakchiev) gets forced to lure a stranger to the family’s residence as part of a violent “initiation”. Jed picks the wrong person, though, as he selects Betty (Lorina Kamburova), the daughter of Texas Ranger Hal Hartman (Stephen Dorff). Partly due to Hartman’s influence, Jed winds up relegated to a mental institution. Though this seems to detach Jed from the influence of his evil family, the boy still develops along psychopathic trails. 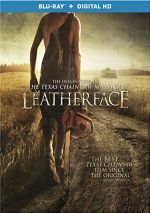 10 years after his incarceration, Jed (Sam Strike) escapes from the psychiatric facility and follows a route that eventually reunites him with his nutty clan – and points toward his future as “Leatherface”. As I indicated at the start, the idea behind Leatherface shows promise. The crazy family seen in Massacre didn’t pop up out of nowhere, so I like the idea of a film that shows the evolution of its most memorable character. Unfortunately, Leatherface offers a fairly terrible exploration of its subject matter, one rife with clichés and tired ideas. Indeed, the entire first act feels liberally “influenced” by 1978’s Halloween - and by “influenced”, I mean it steals from the John Carpenter classic. The rest of the movie comes across as marginally more original, but Leatherface never manages anything that seems creative. It hits on a series of horror tropes and fails to explore the characters or the plot in an effective manner. It doesn’t help that Leatherface mistakes graphic violence for exposition and development. Without any form of build-up, the movie starts at “11” and throws out many scenes of bloody nastiness, all in an attempt to hide its basic lack of substance. I’m not sure how talented pros like Dorff and Lili Taylor got roped into this clunker – they needed paychecks, maybe? Whatever the case, Leatherface delivers a slow, pointless attempt at horror that goes nowhere. 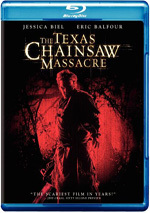 Leatherface appears in an aspect ratio of approximately 2.35:1 on this Blu-ray Disc. The transfer presented the film in an appealing manner. Sharpness looked good. A smidgen of softness hit some wider shots, but those instances remained quite insubstantial, so the majority of the flick showed fine clarity and accuracy. In terms of colors, Leatherface went with standard orange and teal along with arid yellows reminiscent of the original film. The hues never stood out as memorable, but they were fine for this story’s choices. Music was vibrant and dynamic. While this was never a memorable track, it worked for the story. In terms of extras, a prime attraction comes from a cut of the film with an alternate ending. Whereas the theatrical version runs 1:27:42, this one goes for 1:28:44. The two cuts remain identical until 1:18:08, at which point the alternate version keeps the climax inside the Sawyer house, whereas the theatrical extends to a wooded area. After one character’s death, the denouement stays the same. The alternate ending doesn’t do much to change the film – outside of the setting, both feel very similar. Behind the Bloody Mask: Making Leatherface lasts 13 minutes, 24 seconds and offers notes from producer Les Weldon, writer Seth M. Sherwood, directors Alexandre Bustillo and Julien Maury, director of photography Antoine Sanier, makeup effects Olivier Afonso, and actors Stephen Dorff, Lili Taylor, Sam Strike, Vanessa Grasse, Sam Coleman, Jessica Madsen, and Finn Jones. “Mask” looks at story/characters, the use of two directors, cast and performances, photography and effects. A few useful notes emerge but “Mask” remains fluffy much of the time. Six Deleted Scenes occupy a total of 21 minutes, four seconds. One-third of this running time comes from the same “alternate ending” I discussed earlier. As for the other five scenes, they tend to provide minor exposition for some supporting roles. None of them provide information that makes them memorable or especially useful. The disc opens with ads for Jigsaw, The Hatred, Blair Witch, The Devil’s Rejects and The Vatican Tapes. No trailer for Leatherface. As a premise, the prequel concept of Leatherface shows promise. However, the film brings us nothing new and seems like little more than 88 minutes of graphic violence in search of a story. The Blu-ray offers very good picture as well as solid audio and a few supplements. Leatherface becomes sub-mediocre horror.